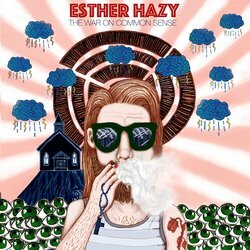 Esther Hazy are an indie-folk band formed in Montreal, now based in Melbourne, featuring members from Australia and Canada. Following the ending of psyche-blues band Young Dogs in 2017, Ed Denton (vocals, guitar) and Paul Lucyk (vocals, guitar) and Neil Robinson (bass) started Esther Hazy, a more laid back indie rock group drawing inspiration from 90’s alternative rock such as Radiohead and Jeff Buckley as well as modern indie bands such as Alt J and Grizzly Bear. With Oliver Martins on drums, the band released their first EP “Live at The Paintshop”. Following the move of Martins to Ottawa in early 2018, Esther Hazy were joined by Walid Moon on drums and began work on their debut LP, a more folk style album in the vein of Father John Misty and Bon Iver, which was produced and recorded by Denton. Moon left the band after 6 months and the band continued to work on the album with a number of other drummers recording and touring with the band. Ed Denton relocated the band base to his hometown Melbourne and in late 2018 the band completed their album entitled “The War on Common Sense” due for release in January 2019. Sporting a melancholy mood characteristic of Coldplay's Parachutes or Radiohead's In Rainbows albums, Apathy is spiritual climax of the album. Acoustic guitars swing to the gentle 6/8 rhythm while lush tremolo and slide guitars set a tender mood. The vocals sing sarcastically of how the world's problems are solved by apathetic ignorance and the song finishes with an epic monologue.